Let's talk about what exactly the driver is responsible for when it comes to hauling freight. To be on the safe side let's assume that the driver is responsible for absolutely everything unless I specifically say otherwise. And I probably won't say otherwise. Couple of really important things to note here. The first one simply relates to how fast a truck can go around a curve. Well, there's two ways to find out. 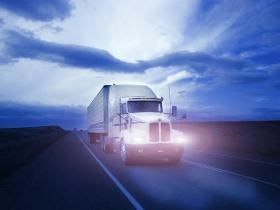 One, you could hire an engineer and give them the numerical details involving weight, center of gravity height, turn radius, etc and a few simple calculations later you have the exact speed a specific truck can go around a particular curve. ...nothing in the world is more important to any trucker than safety. The easier way is too just get in a truck and find out the “real world” way. DON'T do this. NOT EVEN ONCE! Often times when a truck tips over on an interstate highway ramp the driver knew when he took the exit that he was going way too fast but figured he'd find a way to get it slowed down really quickly. Misjudgments in a big rig can be really, really bad sometimes. Taking chances and making assumptions can be equally terrible. I realize that it's out of order to cover this topic right now but I don't care....nothing in the world is more important to any trucker than safety. There is no bad time to mention it. The other important point here is the focus of this section....the driver is totally one hundred percent responsible for the safe and proper loading of his truck. Once the shipper puts the freight on your trailer and you decide it's road worthy then it now becomes your responsibility. Does this mean that if someone loads your truck in such a way that you're not happy with then you don't have to haul it until they do it your way??? YES! That's exactly what that means! Try to avoid making enemies on the dock. Rarely will you benefit from that scenario. The shipper usually won't argue with you though. They know you're responsible so if you say you want it a certain way they do it. You don't have to make this into a big argument. It's your responsibility so the truck doesn't move until you say it's ready to move. Period. If they have any concerns let them call your company and complain. Your company will just tell them the same thing you already told them anyhow. So don't stress it. It will be done your way. Again, just don't leave the shipper until you're happy. I've had numerous shippers try to talk me into letting them load it a certain way. I didn't stress, I didn't argue. I just explained that in my experience I've found certain methods that work well and so I'd prefer they load it the way I'm comfortable with. Try to avoid making enemies on the dock. Rarely will you benefit from that scenario. The dockworkers will just want to make life miserable for you if they can, and believe me they usually can. Real miserable. So be calm, talk it over, and if they do happen to continue with giving you a hard time gladly give them your company's phone number and let them call your company and talk to your boss. No biggie.